Professional high resolution thermal imaging cameras, sometimes called infrared cameras can run over $10,000 depending upon what features you want or need. Native high resolution thermal sensor, interchangeable lenses with auto calibration, extra wide temprature range and advances reporting with built in mics all drive up the cost of thermal cameras. But what if you don't need the most demanding specs and all the bells and whistles? Fortunately, there are plenty of budget or “cheap” thermal imaging cameras that may fit your needs on the market. What is a thermal imaging camera used for? How Much Is A "Cheap" Thermal Camera? Low cost thermal imaging cameras can be divided into two categories; under $1,000 and under $500. Thermal imaging cameras under $1,000 are typically handheld, stand alone devices that have decent native thermal resolution for home use and light professional work. Some of these models such as the FLIR C3 and FLIR E4 have built in WiFi which makes it easier to share and create reports. Thermal imaging cameras under $500 are typically thermal sensors that attach to a cellphone and use the phone's display and processing power to capture images that later on can either be saved to phone memory or send them over the internet. 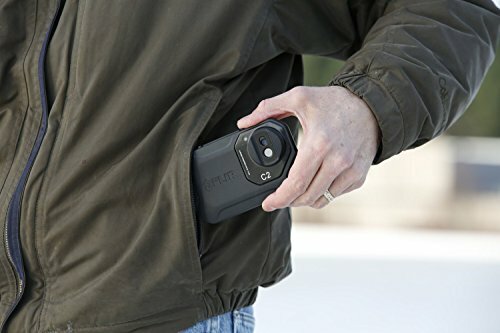 The FLIR ONE and Seek Thermal are two good examples of cell phone thermal cameras under $500 which we are looking at here. For a first time purchase as long as you have an iPhone or Android device these can be the best purchase if price is the most important factor to you. To be clear you will find many "thermal" temperature readers (IR thermometers) on the internet that are not thermal cameras but only measure temperature and display that on an LCD screen instead of an actual picture with different temperature areas shown in different colors. With thousands of applications for thermal imaging, it is hard not to miss all the thermal cameras being sold in today’s market. 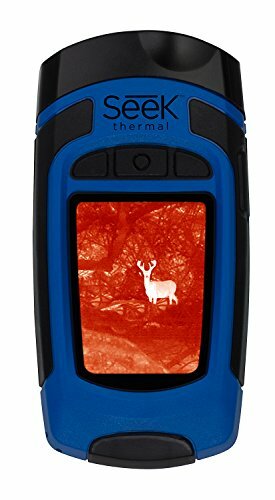 Get into the unseen world with the Seek Compact Thermal Imager. 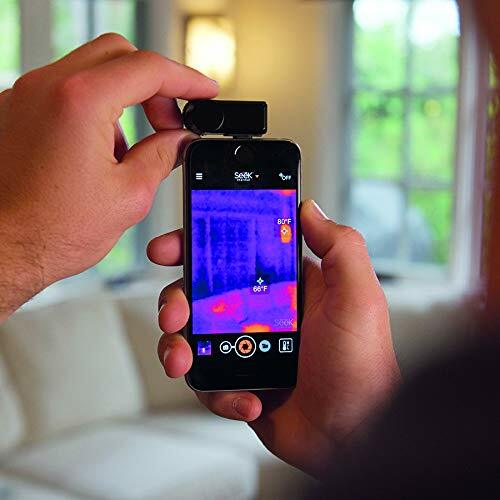 A smartphone thermal imaging device that when connected transforms iOS and Android smartphones into a thermal imager. This model depends on the screen size and battery life of your smartphone, but other than that, it is powerful, accurate, and important in thermal applications. At the heart of this thermal imager is a 206 x 156 thermal sensor. It can identify specific sources of heat after you connect it to your phone. The thermal sensor can detect heat through walls as well as heat signatures in total darkness. It is a professional model that is ideal for identifying air leaks, electrical hazards, clogged pipes, etc. and can be used for light commercial use. Seek Compact has a working range from of up to 1000ft. It lets you maintain a safe distance from dangerous equipment and areas like a house engulfed in a fire, or a deer behind a tree. This way, you can stay safe and get your work done more efficiently. The Seek Compact uses a 36-degree field of view. It is a common feature in thermal cameras in this class. This is because it helps to reveal heat signatures over a wide area which is most useful in outdoors situations since you can see further. Apart from recording photos, you can also record videos which are more revealing. When you want to know the story that an electrical line is telling you, a video helps to follow a path making it easy to identify a problem. It has a 9Hz refresh rate used for steady images however tracking faster moving objects or targets will cause blurry images. Being compact and small, the Seek Compact is the perfect companion. It stores in a hard carry case that is waterproof and impact resistant. The storage case is pocket size so you can carry it discretely and it weighs very little. The Seek Compact connects using your phone’s charging port. It is compatible with iPhone 5, 5c,5s, 6, 6+, and 5th gen iPod Touch. It will, however, not work with 4th gen iPads, all versions of the iPad mini, and the iPad Air. There’s also an Android version that works with most Samsung phones, HTC One, and Motorola phones. The Seek Compact has an adjustable focus lens that gives you the flexibility of viewing images from as close as 6 inches up to 1000ft. It makes a shutter sound that lets you know when you take a still photo. Its images might be a little bit skewed when used in bright outdoor conditions, so you are better in a shaded environment or in low light. This camera includes a free mobile app. It helps to analyze footage and the images you take for a better understanding. It also makes it easy to control the camera features like the color palettes and the scene modes. Color palettes include black and white, cool, and Tyrian while the scene modes are the spot and high/low displays. This way, you can customize the scene according to the conditions and your requirements. Seek covers the Compact thermal imaging camera with a one-year warranty for any defects that are as a result of Seek. The two thermal imagers share a lot of specs including the 206 x 156 thermal sensor. They also have the same temperature range. However, the Seek Compact XR has a detection distance of 1800ft and a narrower field of view that is 20 degrees wide. The Seek Compact is a semi professional-grade thermal imager that is versatile. It has a solid body but remains portable and intuitive. All you need is a compatible smartphone, and you can record thermal videos and photos like you would with a high-end thermal camera. Thermal imaging tools are an effective way of troubleshooting problems in electrical, building, and mechanical applications. Today we look into the Perfect Prime IR0001. This is a unique and versatile thermal imaging camera with simple features. If you want to identify heat loss, moisture, intrusion, and other structural defects that are resulting in heat or air-conditioning loss, you will be happy with this brand. It is also a great choice for car mechanics. It is a budget-friendly model with adjustable features to bring thermal imaging accuracy into needed situations. The Perfect Prime IR0001 features a 32 x 32 thermal sensor which is a lower resolution however at the price point of this camera that is to be expected. It can deliver contrasted and detailed images with up to 1024 pixels. This will eliminate all the guesswork when reading results as you can tell the hot and cold spots in an instant. You can take measurements in the temperature range of -200to 3000C. This makes it possible to use it around hot equipment in an industrial setting or even check the temperature of your food in the fridge. With a temperature accuracy of +/-2 degrees, it is hard to miss a thing with this thermal camera. It captures thermal images with its 6GHz refresh rate. While not suitable for tacking faster moving objects it is fast enough for stationary images and slow moving ones. The Perfect Prime IR0001 is one the lightest handheld thermal imagers. It boasts an ergonomic handle that is simple to use even in outdoor conditions. The brand wants to keep it simple that is why you have only one shutter button and six other buttons to operate the camera intuitively. You will like that you can view the thermal images on a 2.4-inch full angle LCD screen that has a visible resolution of 0.3MP. It can save the pictures on a 4GB SD card that comes with the unit. The saved images form the basis of analysis since you can transfer them to your computer for an in-depth look. While it would be nice if the screen had a higher resolution this is a budget thermal camera and it gets the job done. The Perfect Prime IR0001 showcases reliability in the field thanks to the use of four AA batteries. They are easy to pop out when changing them which means you will never have to rely on a charger. The first batch of batteries is not supplied. You will have to provide for your thermal imager from the start. We do like that this camera has a warranty of two years on all the parts. We would have loved if the thermal sensor had an extended warranty. Either way, the Perfect Prime has a decent warranty length for a very cheap thermal camera. This thermal imaging camera comes with a protective bag for travel. It keeps the device safe from the elements. You also get a wrist strap that is useful in case you want to perform other tasks with your hands while using the camera. It also helps reduce the chances of it being dropped. The Perfect Prime IR0001 is considered one of the affordable thermal imaging cameras that actually work. It is ergonomic and rugged to withstand industrial applications while offering you accurate readings to make troubleshooting easier. It is suitable for beginners since it does not have a host of advanced features. We recommend this camera for home owners and do-it-yourselfers who want a cheap thermal camera around for occasional use. 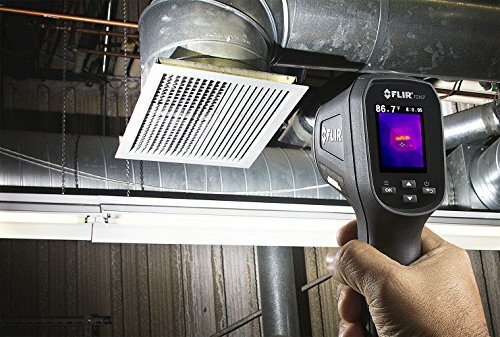 The FLIR TG130 is all about saving you money when inspecting HVAC systems. It is a comfortable device which makes it a good model for a homeowner. If you are looking to detect heat loss around floors, doors, pipes, windows, and locate spots where insulation is poor, all you need is find your target, aim the thermal camera and press the shutter button to capture a thermal image for inspection. With the help of an FPA (Focal Plane Array), uncooled microbolometer, the spot thermal camera will deliver reasonably bright images that will help you identify a problem fast and easy. The infrared resolution is at par with more advanced thermal cameras that offer extra features. At 80x 60 pixels, images will have a thermal contrast in them and be fairly detailed. 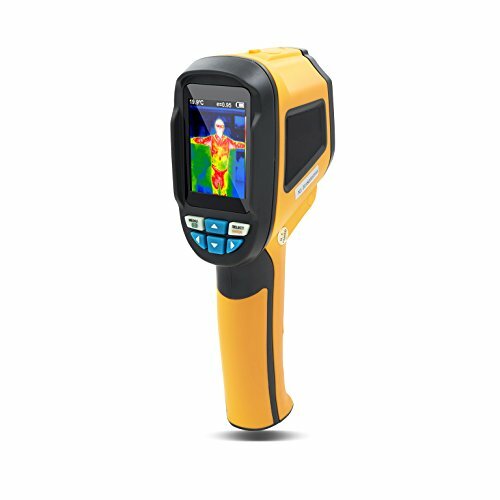 It is complemented by a 1.8-inch TFT LCD to provide a good view of the thermal image. The thermal camera is useful in a wide range detecting temperatures from 140-3010F. It will serve you well when you want to inspect some equipment including car engines. Its usefulness spans across many different applications including inspecting your refrigerator to ensure your food is stored at the appropriate temperature. This thermal imager does not have an option of saving the images unfortunately. It will just identify the hot and cold spots for you, and then you can act on the information you get. It is a good time saver as you will not need to visually inspect pipes and insulation systems while trying to identify the problem. Being without an option for saving images is limiting because you cannot perform any analysis on a PC. This means you can only look at one image at a time and try to diagnose your problem. However as this is very reasonably priced thermal camera there are going to be some features not present. This camera uses a fixed lens. It does not need focusing to get a clear view. It has a 55 by 45 degree field of view. This feature allows you to see more of the image from a safe distance. With a 9Hz refresh rate, it is not a good idea to keep moving the camera as images will be blurry and hard to interpret. The simplicity of this thermal camera is what makes it tick. Its main function is to identify temperature differences in a given image area. It has one trigger button and no touchscreen to complicate the process. It also has one iron color palette. The images are contrasted to help figure out what you are seeing and identify the source of the problem. You will appreciate that this thermal camera is lightweight. Weighing in at only 7.4 ounces, it is the perfect tool for using for extended periods without suffering hand fatigue. FLIR TG130 uses 3x AAA batteries. They will give fours of use. AAA batteries are readily available and easy to replace. However, if you will be using this thermal camera occasionally, you can get a few months of use from one set of batteries. It even has an auto-shutoff feature after five minutes of inactivity to preserve the battery life. The FLIR TG130 has a 10-year warranty on the thermal detector and a two year warranty on the entire thermal camera. The FLIR TG130 is an entry-level spot thermal camera. It is perhaps the easiest thermal imager to use. It has only one purpose which is to identify heat changes in a single image. Its features add up to a simple tool that any homeowner will want to have for general maintenance and inspections around their home. The beauty of handheld thermal imaging cameras is that you don’t need any specialized training to know what the screen is telling you. The Pyle Infrared IR Thermal Imaging Camera is at the center of the competition in this market. With FLIR ranking at the top, this model presents high-end features that only some of the best FLIR and Fluke thermal cameras have. It is a small handheld thermal imager that you can use both indoors and outdoors. Pyle utilizes a digital, fixed focal, thermal sensor that offers detailed readings that are accurate for HVAC and electrical inspections. The device has a 2.4-inch digital display that lets you see the images in grey, iron red, high contrast, and rainbow color palettes. You can preview and delete the pictures using the digital LCD screen. This device uses a simple point-and-shoot design where you only need to point the camera to the point of interest and press the shutter button in one click. It comes with a 4GB SD memory card that allows you to store the images. It can also take larger SD cards up to 16GB. 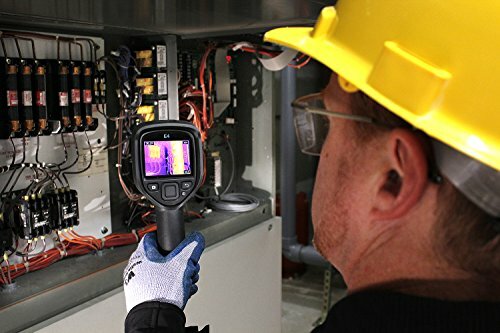 With a detecting temperature range from -40F to 5720F, this thermal imager is applicable in a variety of situations from building projects to repair, and maintenance jobs. It displays the hottest and coldest parts on the screen to allow problem issues to be quickly seen and diagnosed. However, Pyle has a slightly smaller field of view at only 20 x 20 degrees. It has a fixed focus distance of 0.5m. This means it is faster to do your scans with this thermal camera since it does not require a regular change to the focus system. Being a low-resolution model, you will have to be close to the target image to obtain the details you need. As a handheld model, this thermal camera is simple to work with and take to the project site. Weighing in at only 12.8 ounces, you will never notice its weight of this camera as it is less than 1lbs. You can even use the included wrist strap when your hands are occupied. The device has six intuitive buttons. Four of the buttons help to navigate the images, and the other two give you access to the menu and allow you to select the different options like the color palette. And when you are done performing inspections, the thermal camera can be stored in its case for safety. It boasts a sturdy plastic chassis that will withstand most falls in the field. It is even safe in the hands of kids so if they want to explore the world of thermal imaging, this device is all you need. Pyle thermal camera operates using four AA batteries. These cells are readily available, and they always come cheap. The batteries can run for months depending upon how much you use it, and it is easy to change them without any tools. Pile offers a 1-year warranty for this product. Although not nearly as long as high-end models considering its price, it is good to know for a year, you don’t have to worry about the components and the thermal sensor. 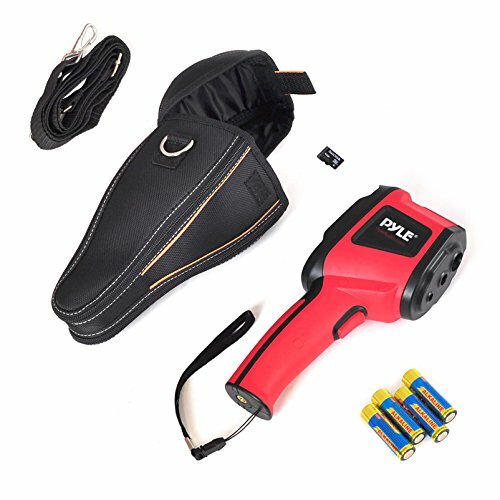 The Pyle Infrared IR thermal imager is an easy pick when you want something that has a long battery life, is effortless to use, and can deliver quality readings. 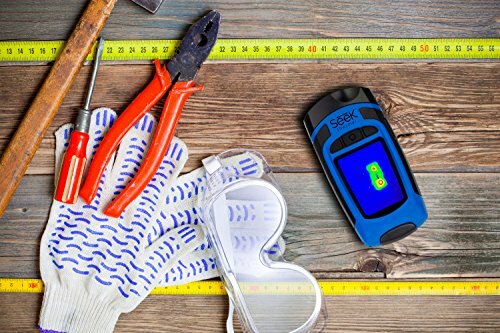 With this device, you can do inspections at home or use in a professional setting like seeing through smoke and finding leaks in thermal insulation. 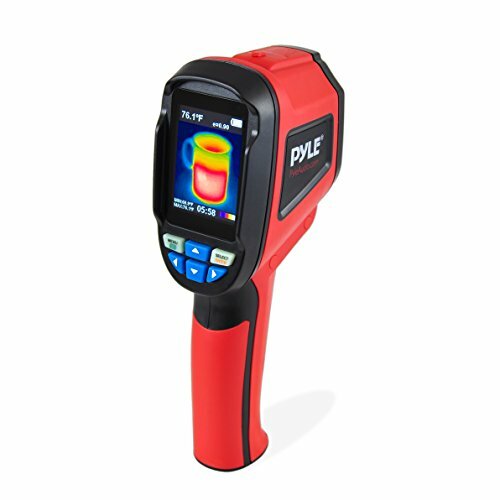 Don’t miss out on the distinct features that the Pyle thermal imager has to offer. Professionals, DIYers, outdoor enthusiasts, and hobbyists are all fascinated by the world of thermal imaging. 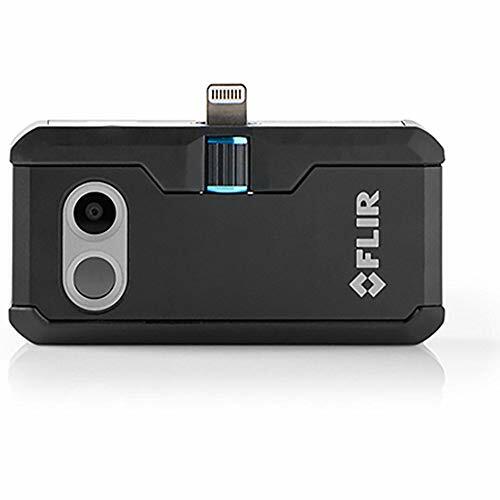 Today, we compare three of FLIR’s top performing smartphone thermal imagers; the FLIR ONE, FLIR ONE Pro, and FLIR ONE Pro LT.
All the three thermal imaging cameras are available in iOS and Android versions. Making them available to use for almost all smartphone owners. This model is aimed at homeowners and outdoor enthusiasts who like to explore and identify problems in their home without the help of a professional. It can see in total darkness and transmit contrasted 1080p footage; note that this is the visual camera resolution. This camera is built around a Lepton Imaging Core which has 80 x 60 pixels resolution. It gives you crisp videos that are easy to deduce the right information from, before calling in a professional if needed. 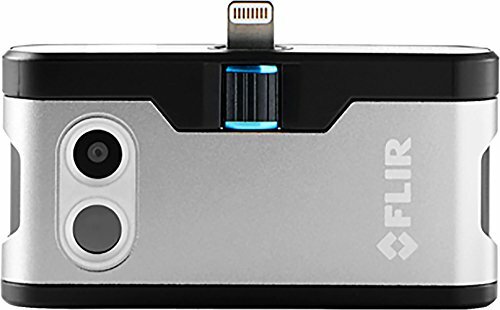 The FLIR ONE connects using your iPhone’s charging port. It is an adjustable height connector so that you don’t have to remove the phone’s case when you plug it in. The FLIR ONE operates at temperatures from -40F to 2480F. It shoots radiometric video images and MPEG file formats for iPhones and MP4 for Android phones. It also incorporates MSX technology which involves interlacing a digital visual image with a thermal image for more clarity. This thermal camera relies on the battery life and storage space of your phone. FLIR ONE has a one-year warranty. These thermal cameras have lots of similar features including being aimed at professionals. They have advanced imaging systems that FLIR refers to as VIVIDIR. The FLIR ONE Pro offers 160 x 120 resolution and a 17mK thermal sensitivity while the FLIR Pro LT uses an 80 x 60 sensor and has 100mK thermal sensitivity. 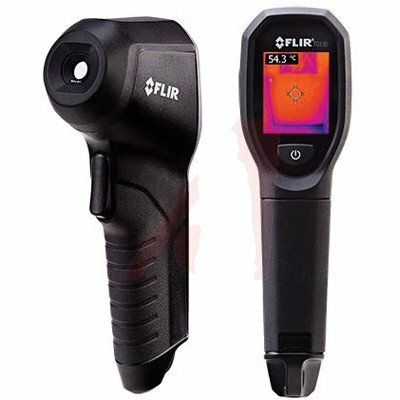 But the PRO model has an detecting temperature range of -40F to 7520F, the PRO LT is similar to the FLIR ONE with a range of -40F to 2480F. This indicates that the FLIR PRO is ideal for inspecting very hot equipment where the other two models will not work. This also makes the PRO the best choice for professionals doing regular inspections. All three thermal cameras have MSX imaging technology and shoot radiometric images. The professional models can withstand impact from falls as high as 0.8 meters. No wonder you can use them in the field. Like the FLIR ONE, these cameras will shoot at a 9Hz refresh rate. It is a remarkable way of shooting moving subjects since images do not appear choppy except a little at the edges; unless you are moving/panning the camera quickly. You can also shoot time-lapse videos with all three cameras. They all have ten color palettes and emissivity settings which help identify different targets easily. FLIR ONE Pro and FLIR Pro LT each come with a 1 ½ years warranty. We can all agree that the FLIR ONE, FLIR ONE Pro, and FLIR ONE Pro LT are all powerful thermal cameras for the price. These devices are extremely portable to take to a project, use at home, or the outdoors without worrying about the size and weight. The FLIR ONE Pro has the upper hand in terms of resolution which steals the spotlight from the other two thermal cameras. Designed for indoor and outdoor applications, the Seek Reveal Thermal Imaging Camera is a top pick for affordability and convenience. It is a well-rounded device that you not only get to use during building inspections but is also useful for night hunts or finding a lost person or pet in the darkness. The Seek Reveal is built around a high-performance 206 x 156 Vanadium Oxide microbolometer. It accurately identifies heat signatures in the range of -460to 6260F which is pretty good for a budget thermal camera. The wide temperature range means you can identify heat loss and moisture intrusions as well as use the camera in rescue situations where temperatures are well above or below normal. For those in the building inspection industry, it is a handy tool for identifying missing insulation leaks. It saves you time, energy, and money since all it requires is taking the readings and getting the right information instead of opening up walls while looking for problems. This camera also shortens the time it takes to make important decisions regarding repairs. It has an operating distance from 6 inches up to 500ft. No wonder it is a go-to pick for DIYers and professionals alike as it can work in many different places very easily. With a 36-degree field of view, you can quickly scan a room and find the problem areas on the 2.4-inch LCD color screen. And when you need to see in the dark, a 300-lumen flashlight will provide the illumination that you need. Record thermal images and save them on the device’s SD card. It does not have Wi-Fi capabilities, but you can transfer the photos to a laptop or PC for evaluation using an SD card reader or transfer cable. A rugged, rubberized exterior is what the Seek Reveal is all about. It is an ergonomic handheld device that is slightly bigger than a smartphone somewhat resembling a phaser from Star Trek. It features three-button controls that let you operate the imager fast. With curved sides and weighing only 0.16 ounces, it will not be a big deal if you are out all day inspecting houses. You have every reason to pick the Seek Reveal for your next project thanks to the 10 hours of battery life. This thermal camera is powered by a Lithium-Ion battery that is rechargeable using a USB cable. A wrist lanyard is always also included to keep it close and help prevent you from dropping it. 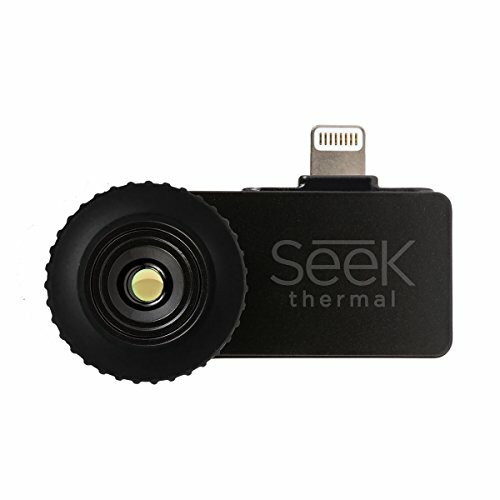 Seek covers this device with a one-year warranty if you purchase it on the Seek website at www.thermal.com or an authorized Seek dealer such as Amazon. Seek will take care of manufacturer defects and replace any product within the one-year period. 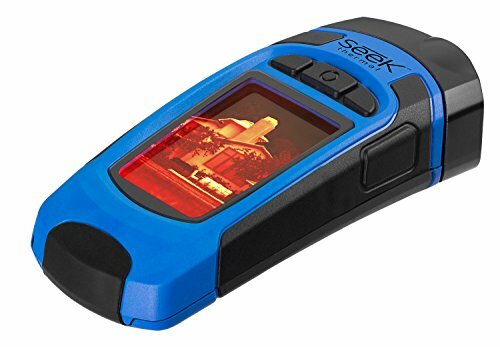 For professionals looking to get more from a thermal imaging camera, there’s the Seek Reveal Pro that has a high-resolution 320 x 240 thermal sensor. It has a zoom function up to 4x, and you can adjust emissivity as well as toggle the reticle on and off. It also has software capabilities for analyzing thermal images. It does however cost more due to the higher resolution. Seek Reveal represents powerful thermal technology in a simple device. It is effortless to use, and it covers a wide array of uses. The device is popular among homeowners, DIYers, hunters, and outdoor enthusiasts. Whether you are in a freezing environment or its 100 degrees outside, Seek Reveal provides the insight you need in hot or cold environments. For a long time, inspecting switch boxes and electrical cabinets involved opening the circuitry and using thermal thermometers to detect problems. This method was dangerous as sometimes it would be too late to discover a hidden hot spot. But with the advent of thermal cameras, you can perform inspections from a safe distance and get the information you need fast. FLIR introduces the FLIR TG167 Spot Thermal camera with a Lepton microthermal, uncooled sensor, for spot measurements. The FLIR TG167 is designed for identifying hidden hot and cold spots by targeting heat in a specific location. The thermal sensor has an 80 x 60 pixels infrared resolution. It can detect heat changes in a temperature range from 130-7160F which is good for a budget thermal camera. This is a super wide range which means it can detect heat changes in hot machines and equipment which helps to identify potentially dangerous zones. We like that it has a 25-degree lens, a 2-inch TFT LCD screen, and a 9Hz refresh rate. It allows you to focus on small details even from a distance. Although we would note that for tracking moving objects the images will be blurry due to the low refresh rate. The TG167 stores images at bitmap (BMP) color images that you can save using the 8GB onboard storage. Onboard storage is also expandable to 32GB. You can transfer the files using a USB cable or the SD card to a PC for analysis. It is super easy to operate this thermal camera. It comes with a printed document to guide the process. It has only four controls and a shutter for the functions. Even if you may never have handled a thermal camera, we don’t see you fumbling with the controls as they are very intuitive. It has a rechargeable Lithium-Ion battery to give you five hours of continuous usage. The camera comes in a rugged design as it can withstand being in the harshest temperatures and falls of up to 6ft. It has a warranty of ten years on the infrared detector and two years on parts and labor. This guarantee gives a pretty good idea about the lifespan of the product. This means you can easily get repairs if issues arise long after buying this thermal camera. FLIR has one of the best warranties in the industry which is one reason we like them so much. Using it in the field is also easy with the help of a wrist lanyard. It will come in handy when you need your hands for something else other than using the thermal camera and also helps prevent the chance of dropping it. But it is compact, so it can comfortably fit in your pocket when it’s not in use. If you are out the elements and are wondering if the FLIR TG167 is going to take it, you can always use a case that is sold separately. These two thermal cameras provide spot thermal inspections. While the TG167 has a 25-degree field of view, the TG165 has a 50-degree field of view. It indicates that the TG165 will give you a wider viewable image area on a small screen while the TG167 will show more details. It also has 8-hour battery life as compared to the 5-hour battery life of the TG167. The FLIR TG167 is a leading thermal camera in electrical, building, HVAC, and automotive applications. While its not suitable for everyday commercial use it is great for home owners or if you need to do inspections every once in while. It is a safer and much more effective tool for performing inspections than touching hot areas which are potentially dangerous. This pocket-sized unit will go wherever you want. It is compact, rugged, and delivers detailed images for definitive inspections. 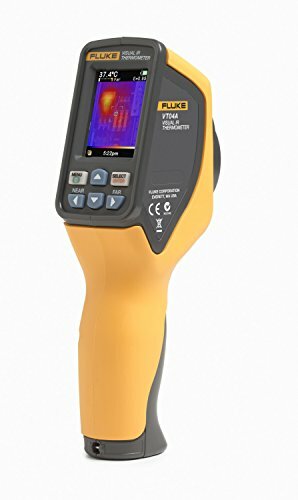 The Fluke VT04A is a pocket-sized visual IR thermometer. Compared to other infrared cameras, this one is 40% smaller making it ideal for home and industrial applications. As an infrared thermometer, it means you can record the temperature of the things you are inspecting without touching the surface or getting too close to the object. This device is useful for fragile objects like your computer’s circuitry or for things that are out of reach like air conditioning. It is handy when you need to see an animal behind the bushes or take the temperature of frozen food in your freezer. Fluke VT04A brings high resolution to the table with the help of PyroBlend Plus Optics. It has a 31 x 31 sensor that allows you to capture thermal images alongside the built-in digital camera. It aligns the thermal image with the visual picture so that you can have a detailed view and a better and faster way of knowing what you are looking at and coming up with the relevant conclusions. It has an impressive field of view at 28 x 28 degrees, that is unlike other small handheld thermal imagers. We like that you can set the high and low temperature when taking measurements and the thermometer is set off when the selected temperature is exceeded. Not to mention, it can capture time-lapse images and can start recording automatically when the alarm is triggered, so you don't need to go back to the settings. This thermal imager will detect the hottest and coldest part of an image through its cold and hot spot trackers. You get an intuitive device that allows blending of the thermal and visual image with one button. It has a heat map overlay at 0%, 25%, 50%, 75%, & 100%. This allows you to have a detailed view of the data you collect. As small as it is, the Fluke VT04A is quite a remarkable thermal imager. It can detect temperatures in the range of 140F to 4820F. It opens up just about every possibility of using a thermal camera from HVAC to building inspections, electrical, and mechanical industries. Because of its uncooled thermal sensor, this IR imager is a good choice for taking measurements from as far as 6ft away. It maintains a high level of accuracy thanks to its capability to align visible light in near and far modes. This IR imager will store up to 10,000 images in its 4GB SD card storage. Now you can take as many thermal photos as you would like when trying to identify a specific problem in a system. It includes professional SmartView software that helps to go through the images and create relevant reports as well. Fluke VT04A is powered by four AA batteries instead of Lithium batteries like in the VT04. They give you more running time since it could be months before they ever need replacing and are cheap to replace. Continuous use of this IR imager yields eight hours of use. This infrared imager has a 2-year warranty and comes with a soft case for portability. Fluke also offers a cheaper option VT02 to their Fluke VT04A. It’s a pocket design that uses a similar uncooled pyroelectric ceramic sensor to capture thermal and visual images. It has three blended modes instead of five like the VT04A which are 25%, 50%, and 75%. We find the modes as the only major difference since it is also supported by SmartView analysis and reporting software as well as being powered by four AA batteries. 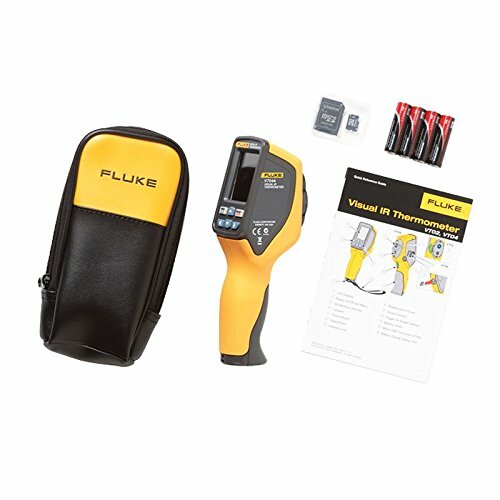 The Fluke VT04A IR Thermometer is designed to make your troubleshooting much easier at a low cost. This low-cost model gives you professional quality readings and images with no training needed. 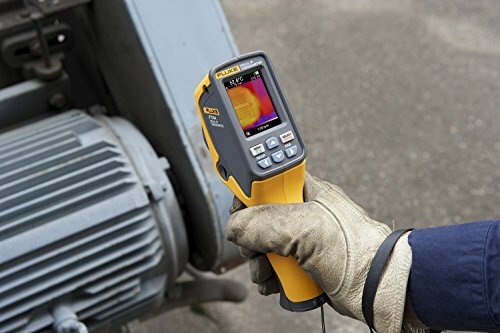 For visual and thermal benefits, the Fluke VT04 is a great choice for budget thermal imager. FLIR has redefined the way we view thermal imaging. It’s now about time you grab a thermal camera as part as your toolkit. These cameras have become affordable without making any compromises on the quality. Today, all eyes are on the FLIR C2. This camera is a standalone thermal imager designed for the building, inspection industry and home owners due to its small size. 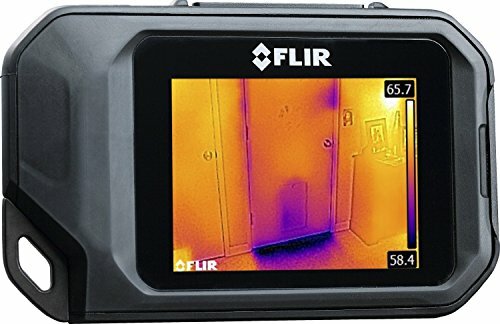 If you are a home inspector, contractor, electrician, HVAC specialist or plumber, this thermal camera is a must-have. It will save your client’s money on maintenance costs as it allows you to see energy leaks, plumbing clogs, and hot spots. This means you get to catch structural defects in time which can potentially help your clients save a lot of money. This thermal camera uses a highly sensitive detector that can reveal heat changes from -140F to 3020F. This enables it to pick up subtle changes in temperature so that you can see a thermal pattern that will help identify the hidden insulation leaks. For an HVAC specialist, this is vital as it affects the comfort in a home. It affects indoor air quality when you have leaky doors, failing windows, etc. The FLIR C2 combines a thermal camera and the detector to bring out details in the images. It boasts a VGA 640 x 480 pixel resolution camera and an 80 x 60 pixel thermal sensor. Together, they create a 320 x 240 pixels resolution image. It’s incredible to see all the colors represented on the images which makes it much easier to identify the issue. The FLIR C2 stores up to 500 radiometric images in JPEG format. Each image can store 4,800 individual temperature measurements which come in handy in the analysis process. This camera also includes MSX thermal imaging enhancement. It adds critical details to the image by overlaying the thermal image on the regular image. It leads to instant recognition of temperature changes. This is because it presents a visible light picture and a thermal image on a 45-degree field of view making it super easy to see all the details in the image that you would not be able to if you were only looking at the lower resolution thermal image. The FLIR C2 has a 9Hz refresh rate. It is ideal for this type of thermal imaging since you won’t be out chasing after a moving target which would cause very blurry images. The FLIR C2 has a running time of 2 hours with a full battery. It comes with the charger, so it is just a matter of plugging in to recharge. You will also like that it is supplied with all the useful hardware to make work easier in the field. This goes for the lanyard where you can hang it around your neck or casually around your wrist. You also get a USB cable that’s useful for transferring images and videos. Analyzing your images and adding the relevant information makes your report more conclusive. That’s why FLIR has their FLIR Tools Professional Reporting software. It is a top-performing software suite that has all the tools you need to show min, max, and average temp information, change color palettes, and add spot meters. The FLIR C2 enjoys the 2-10 warranty that applies to all FLIR’s handheld thermal cameras. The thermal detector is covered for ten years while the parts and labor get coverage of 2 years. You must register your new FLIR thermal camera on their customer care desk available online for the 2-10 warranty. The FLIR C3 is like the C2 in so many ways. From the size to the operation, but there’s additional Wi-Fi functionality. It allows you to perform wireless streaming to other devices like a tablet or smartphone. This camera also has area measurement and picture in picture mode which gives you more details and will save you time. 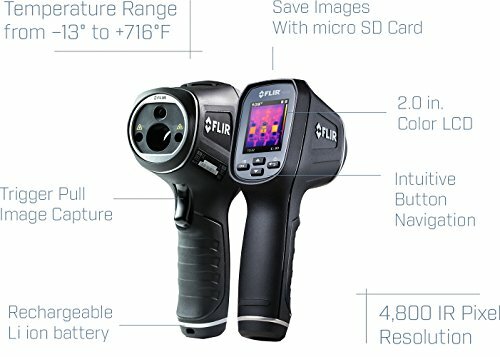 The FLIR C2 thermal camera is not an entry-level model. It boasts features that are seen on high-end thermal cameras only but is also reasonably priced. For the best details with a thermal camera you don’t want to gamble, that’s why FLIR C2 is a top recommendation for a budget thermal camera if size is one of your main considerations. 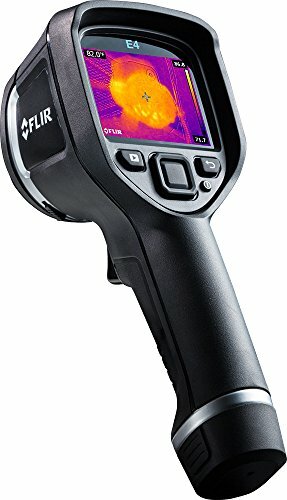 FLIR has a reputation for producing some of the best thermal inspection tools. The FLIR Ex line boasts incredible products from the FLIR E4 to E5, E6, and E8. The FLIR E4 is the cheapest in the line (although for a budget thermal camera it is near the high end) and it forms the basis of our review today. The FLIR E4 is a rugged handheld thermal camera that features a sleek design in a rugged, rubberized finish. It can withstand falls of up to 6ft making it a remarkable tool in the hands of a contractor who spends their days around hard floors or concreate. With an 80 x 60 pixel-resolution thermal sensor, the FLIR E4 is capable of capturing images with decent detail when viewing general areas. It combines the thermal sensor with a 3.1MP visible light digital camera. The digital camera helps to capture high-resolution images which makes the photos more detailed. It even brings in MSX image enhancement which extracts details from the visible light camera and embeds them in the thermal image so that the picture has more information. This way, you can do a detailed analysis on your photos as they will be clearer than normal thermal images with the same resolution. It is a feature that makes this thermal camera useful and on par with models that cost much more. The FLIR E4 has a 45-degree field of view. It has fixed focus so you will need to adjust your distance according to the target to get the best images. It is super easy to navigate the camera thanks to the new intuitive menu. There’s only one button for the onscreen settings. This button reduces the stress that comes having multiple buttons and trying to navigate around the screen menus. The camera stores images in JPEG format giving you a total of 4800 pixels in each image. It can save a total of 500 images. This feature is the change we have been looking for in a budget thermal camera. Instead of analyzing files in the office, you can pick your tablet or smartphone, transfer your files wirelessly, edit them, and send them to your client even before you leave the field. It allows for timely feedback which will save you from coming back to execute repairs at a later date. The FLIR E4 comes with a removable Lithium-Ion battery. It gives you four hours of continuous operational time. That is all the time you will need to analyze structures and detect changes in heat, plumbing clogs, and other inspection details in buildings. This thermal camera comes with a hard transport case to protect it against damage. It also has a USB cable for the manual transfer of files to PC. You will love the coverage offered for the FLIR E4. It is under the 2-5-10 warranty which guarantees coverage for ten years on the thermal detector, five years on the battery, and two years on the parts and labor. To receive this warranty, it’s vital that you register your FLIR E4 on FLIR’s customer care website. FLIR is known for their industry leading warranty length. The FLIR E4 thermal camera is here to provide thermal imaging details in key building inspections at a budget price. It has a compact and user-friendly design to offer optimum functionality. It has integrated MSX imaging technology to help create realistic images that lead to conclusive reports. It is a tool you don’t want to leave out of your arsenal. Technology is advancing rapidly and the boundaries are being pushed further everyday. What you can find today for under $1,000 is an impressive piece of technology that did not exist 20 years ago. Manufacturers like FLIR and SEEK release thermal camera attachments that are becoming more and more popular, provide decent thermal resolution and cost a a of hundred of dollars. We welcome your thoughts and will try to provide you with the latest reviews as soon as a product is released. Stay tuned!